As a child, these words from the Book of Exodus, uttered each year at the Passover meal, my extended family gathered around fold up tables, defined religion for me. Because you, yourselves were strangers in the land of Egypt. The Passover traditions implore us to act as though we were ourselves, literally, strangers in the Land of Egypt. We are encouraged to welcome strangers to our tables each year, commanded to retell the story of the exodus. While the immigration history of America is indeed unique, the greater story of humanity is one of perpetual migration. The Hebrews of the Torah, and Jews throughout the ages, have been strangers wherever we have sojourned. Egypt, Babylon, Western Europe, the streets of New York, certainly here in Boise, Idaho. 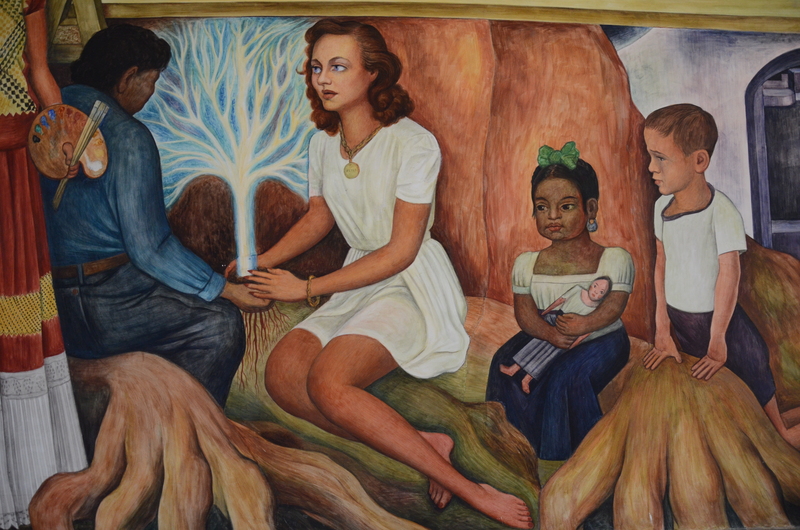 From the Diego Rivera mural, Marriage of the Artistic Expression of the North and of the South on this Continent at City College via When Paint Meets Purpose. We are perpetual strangers who adapt quickly to local ways and yet are always reminded that we are strangers. We learn to hunt and fish, go to rodeos, eat hot dogs in jelly—and yet we remain outsiders—strangers— in certain ways. But the English term stranger is problematic and does not capture the full essence of the Jewish concept of the “ger.” The Hebrew word for stranger, ger, is from the same root as the word for settling down, Gar, to live, to sojourn, to reside. The Hebrews were settled in Egypt for some 400 years prior to the Exodus. Their community grew and they were integrated, at least at first. A young Moses grew up behind the palace walls. And yet the Hebrews remained strangers in Egypt as well, eventually abused by later pharaohs and forced to flee. And when they came out of Egypt, they became strangers again, for the Hebrew word ger has yet another meaning: a convert. The ancient Jews’ passage through the Red Sea and 40 years wandering in the desert offered another kind of strange conversion, a key moment in the development of Western thought that is seldom considered by Western scholars. It was the Jews’ passage out of Africa and into the Near East, into what would become the Judeo-Christian legal system and religious tradition. The wandering Jews, exiles from Egypt, developed a new society, based on the tribal culture of the desert and the religious and scientific advances of Ancient Egypt. They were strangers twice-over: gerim in Egypt, though thoroughly Egyptian, and gerim, converts, in the desert, forming a new community but perpetual strangers in seeking to join that community. That second Biblical sojourn out of Egypt, out of Africa, parallels the kind of human migrations that science continues to reveal today. Migrations of strangers who settle, join new communities, but always bring their ideas and beliefs and knowledge and food and dance with them. This tale could go back even farther to the early reaches of human history, when direct human ancestors first encountered one another in the most intimate of terms. The history of early human migrations is still unsettled, but recent evidence from Australia and Asia points to at least three human ancestor subspecies that intermingled in the millennia after early humans traveled out of Africa. Sixty to eighty thousand years ago, according to some scientists, modern humans (Homo sapiens sapiens) first paired with Neanderthals, a separate human subspecies, in Western Europe and East Asia and later on with the recently discovered Denisovans, another archaic human group, throughout southern and eastern Asia and Oceana. It is still not clear how or when the offspring of these early human migrants arrived in the Western Hemisphere. Estimates range as widely as 40,000 to 12,000 years ago. But when European explorers “discovered” the New World in the 15th Century, their arrival heralded a whole new era of immigration love stories. Even before the establishment of the union, the Atlantic Coast was well known for its mélange of cultures and nationalities and races. Conquerors and the conquered, travelers and settlers, slavers and the enslaved, Protestants and Catholics and Muslims and Jews and animists and Yorubas all met in the early colonies and explored all of the possibilities that came with seeking their fortunes, building a nation, defending territories and falling in love. This, of course, is a generous reading of American history—the conquest of America’s indigenous people was brutal and the young nation was clearly built on the back of African slave labor. But there is no doubt that amidst that brutality, there were also instances of humanity and love between members of different ethnic groups. These relationships—both the loving ones and the many abusive ones— are what the early 20th Century black scholar W.E.B. DuBois called the “stark, ugly, painful, beautiful” fact of American life. But like the ancient Hebrews, in every generation we forget where we came from. Even from the very first settlers on our shores, we confused the immigration equation. In the Disney version of the Pocahontas story, it is the native peoples of this land who are portrayed as exotic and foreign—”strangers in their own lands,” as Native American educator Cornell Pewewardy put it. White settlers wrote their discomfort with foreign sojourners into our earliest laws, banning miscegenation, or inter-racial marriage, as early as the 1660s. Though African people settled in this country at the same time as white Europeans, our early immigration and marriage laws were designed to bolster the institution of slavery and maintain European control. Citizenship has always been tied to the dominant racial ideology in the United States. 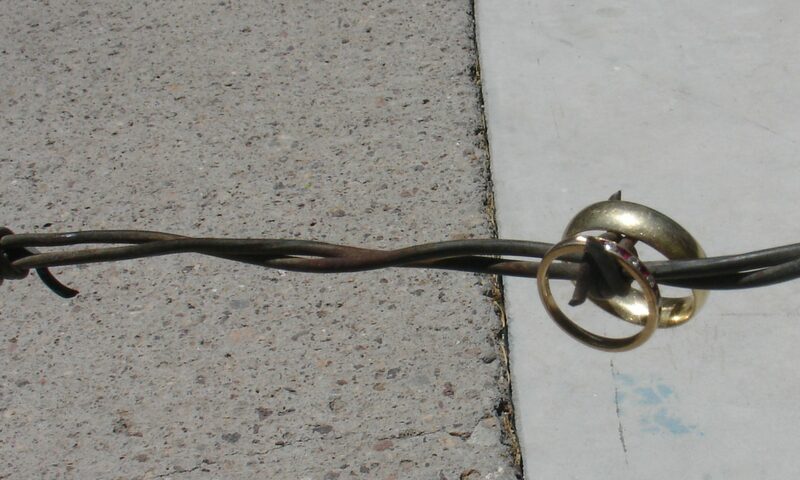 Just as African Americans adopted themes from the Exodus story as they fought off the shackles of slavery in the 1800s, Mexican Americans can claim the mantle of strangerhood today. Juan Diaz, who was deported back to Mexico from Nampa in 2008, feels like stranger in his own land, after a lifetime in the U.S. There has always been trauma in leaving La Virgen. But over the years the trauma of northward migration, a special form of exile invented again and again by millions of rural Mexicans throughout the latter 20th Century, became normal. Juan went North for the first time in 1990, seeking a nest egg to attend college, to study medicine, or maybe animal science, like Nicolas. But he liked the nest egg better than the idea of furthering his studies, so he kept going North—six times in 19 years. He crossed the porous border like everyone else, rebuffed again and again by the Border Patrol—he’s forgotten how many times—until he made it to the interior where he was welcomed with paid work, with freedom of movement and association, with the NFL and college ball on TV. Where his brothers and sisters and father were eventually welcomed with papers. Juan worked as a breakfast cook and housekeeper in Mammoth Lakes, California, and in a wood products plant in Nampa, Idaho. He worked and he went home to La Virgen to renew his ties with his mother, to his mother country. But his exile—this uniquely Mexican form of emigration—was slippery. At first he left home out of economic necessity, unable to find the kind of salary he desired in La Virgen. He followed the example of his father and left home seeking his fortune abroad. But as the fruits of that fortune grew and the economy in La Virgen further stagnated, he accepted this economic exile as his new reality, in many ways giving up on La Virgen. His life abroad—eventually more than half his lifetime—became just his life. Now Juan is exiled back to his own hometown, banned from allá, pre- vented by U.S. immigration law from settling down with his family, getting a work permit and eventually citizenship and living the American dream. Fast forward to today. Congress has the opportunity to make gerim like Juan—a stranger in all of the ancient Hebrew connotations, migrant, settler, convert to the American Dream—whole again. Juan’s American wife, Veronica, is a stranger in Mexico today, living there with their four children, unable to return with her husband to the United States. The Obama administration, while supporting the idea of reforms, has continued deporting strangers from our midst at historically high rates—more than any other president in our history. He is approaching 2 million deportations this year. While this may be counter to our Biblical tradition and counter to the stated rationale of family unification in our official immigration system, it is in line with our own history of welcoming the stranger with fingers crossed behind our backs. Americans have always possessed a certain well-documented optimism when it comes to our futures, our abilities, our rights. It’s right there in the founding documents: life, liberty and the pursuit of happiness. Any American child can grow up to be President of the United States. We don’t, but we could. We can all be rich, but we’re not. We can go wherever we want, whenever we want. Or at least we believe we can. We travel freely across state lines and across most international borders because we are Americans and we are free. In January 2011 I walked into Ciudad Juárez, Mexico, from El Paso, Texas, over the concrete channel that is the Rio Grande. I was carrying a large green backpack and I passed a Mexican soldier who did not even look me over. It was an official international crossing point and no one checked my passport. No Mexican official asked me a single question. Previous PostPrevious House Reps: Who’s Responsible for Immigration Reform?